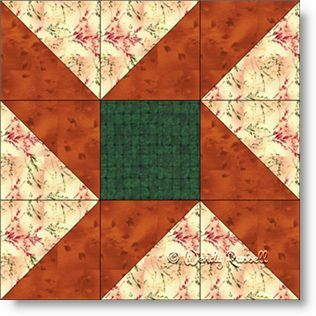 Garden Block is the perfect choice for the beginner quilter. It contains only the two most commonly used patches in quiltmaking -- the square and the half square triangle. These units in this nine patch quilt block, are the first patches that most beginner quilters learn to start their quiltmaking journey. Both of the sample quilts illustrated are set on point but give two very different looks. By switching up the colours or using more colours than I have shown here, your quilt will soon become a family favourite.